First of all Scrum is a framework. 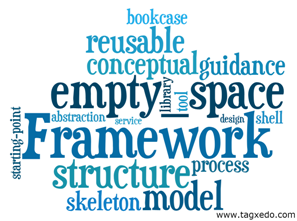 Looking at the word cloud in Figure 8 you can see that an important property of a framework is empty space. Think of a bookcase without space for books or a frame without space for a painting or picture: they are useless. In the same way Scrum leaves room for filling in specialist practices. This filling in is done by the team, guided by their own experiences. To preventing reinventing the wheel all the time, methods and company practices can serve as a starting point for these specialist practices, especially where newly formed teams are concerned. 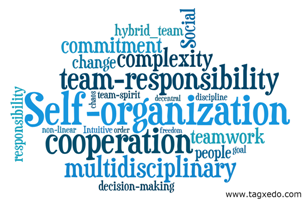 Self-organization points not only to the way the team fill in the specialist practices but also to the way the team independently forecasts and organizes its work. Self-organization is the natural way for people (and animals and all of nature) to work together and the only way to cope with the complexity of today’s systems and projects. As shown in Figure 9, to facilitate this self-organization the team needs mandate, a multidisciplinary, hybrid composition and a clear goal. It needs to be well facilitated and it needs a clear single point of contact toward the business for decisions about priority and requirements. Agile teams conform to the Agile values that we explained in the previous section. 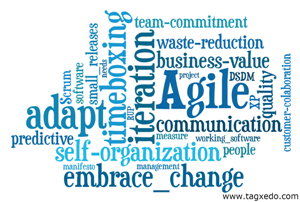 The word cloud in Figure 11 shows a collection of aspects that are associated with Agile. Scrum doesn’t say much about how an Agile team should be formed, it just supposes it is used in the context of a team that follows the Agile values and uses specialist practices from other agile methods. Furthermore Scrum presupposes a support and management organization that enables self-organization of Agile teams. To improve the self-organizing capability of an Agile team the Scrum framework introduces three pillars as shown in Figure 12. 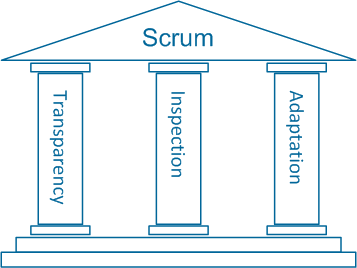 These pillars form the basis for the whole Scrum process that we will explain in the next section. Transparency is all about clarity in goals, planning and results. In the Scrum process long term and short term goals and plans are made visible and realistic. Results are measured only in terms of usable software. Inspection is all about taking time to look back on the product and on how things get done followed by making concrete plans to improve. Adaptation is all about taking action on these plans and experiment to improve the product and empirically find better ways of doing things. Inspection and Adaptation form a continuous improvement cycle throughout the Scrum process. Part 3 of this post is Be Transparent. scrum will definitely ease your work of handling a big project. As a project manager I use scrum in my projects. One of my friends referred me to use the Guide to Scrum Body of Knowledge by http://www.scrumstudy.com. I like the concepts of sprints, daily standup meetings, etc. the SBOK Helped me alot in Understanding how Agile Project Management works.